The night before he was scheduled to announce his selection as CEO of UPS a few years ago, David Abney telephoned his daughter Valerie to break the news to her first. Abney shared that story just days after returning home from Washington, D.C., where he picked up one of this year’s Horatio Alger medals. For more than 70 years, the award has been bestowed upon individuals who have overcome adversity to achieve success and remained committed to both higher education and helping others. Abney, of course, was in good company. He was excited. Sam’s reaction to his being named CEO, he said, laughing, was a reminder that even in big moments like this, he was still second fiddle to Big Bird. “That has kept me humble,” Abney said. That may be true, but the more one delves into the 63-year-old grandfather’s history, the more it seems that humility comes naturally to Abney. He grew up the middle child of three children born to Thomas Abney and Elizabeth Marie Abney in the Mississippi Delta, one of the poorest regions of the country. Greenwood, his hometown, was no different. The Abneys were no different. The only difference between them and the rest of the people who populated that western edge of the state was they didn’t know they were poor. “There was never a lot of money around, but we were happy kids,” Abney said. For years before selling insurance, his father ran a service station. His mother was a stay-at-home mom who worked off and on at the local clothing factory and instilled in her children the importance of education. In 1973, David Abney graduated from Pillow Academy and that year enrolled in Delta State University, becoming the first in the family to attend college. His academic scholarship covered only a portion of the tuition, so Abney went to work at UPS Inc. washing cars, loading packages and cleaning floors to make up the difference. In just 3½ years, he had earned both a bachelor of business administration and the heart of Sherry Tharp, whom he married in January 1977. They packed Sherry’s 1974 yellow and white Monte Carlo with everything they had that winter and headed south to Pascagoula, Miss., where Abney had been offered a job driving for UPS. Within three months, he was promoted to lead driver, in charge of eight others. If there wasn’t enough work for all of them, Abney would lay himself off. In Abney’s world, though, it was the right thing to do. People noticed. The transfers and promotions rolled in, sending Abney to Natchez, Miss., then Jackson and Nashville, Tenn. When the next promotion sent them to New Jersey, it was like getting a foreign assignment. When he talked, the natives thought he was from a foreign country. If he wasn’t crying on the outside, David Abney was certainly crying on the inside. More transfers would come, each time forcing Abney out of his comfort zone. He felt blessed. 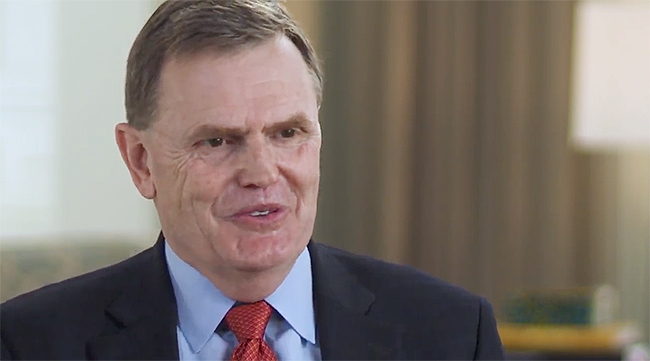 From the time he started with the company at age 19, the good Lord had put people in his path to encourage him to stick with the company or plant in him nuggets of wisdom. He remembered Cal Darden, a former president of U.S. operations who taught him the importance of building people up, catching them doing things right and congratulating them. “He really taught me how to motivate and get people inspired to do the job,” Abney said. After stints in Utah and Arizona, Abney transferred in 2000 to Atlanta, where he joined the management committee as president of UPS’ international operations before quickly rising to chief operating officer and then CEO. In 2016, he was appointed chairman of the board, and UPS now ranks No. 1 on the Transport Topics Top 100 list of the largest for-hire companies in North America. By then, Abney and his wife had started an international symposium at Delta State, bringing global business leaders to the campus to talk to students about living up to their potential. They’ve been doing this for 14 years now because they understand the importance of offering a hand up to those who need it, especially in the Delta, where opportunity is rare. It was the same message Abney sought to impart as he exchanged stories of hardships and triumphs with other 2019 Horatio Alger Award recipients and youth scholars during the 72nd induction ceremonies early this month in Washington. It was yet another heady moment for Abney with his wife, son and daughter and sister, Donna Kyle, watching the poor boy from Mississippi once more make good. Little Sam might not appreciate that, but Big Bird probably would.